A favourite photo | Where to next? I took a squillion photos at Floriade—Canberra’s annual flower festival and the largest one of its kind in the Southern Hemisphere—but I’m especially happy with this one. 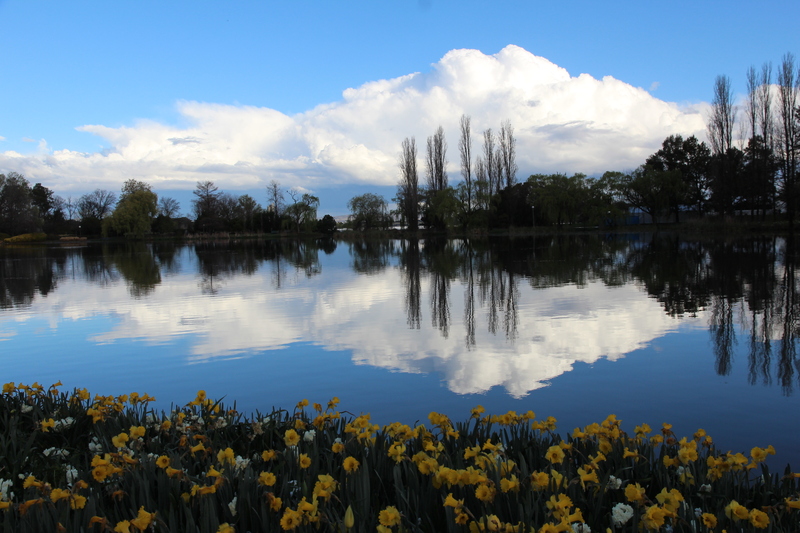 It’s not just about flowers, but about the whole package of what makes Floriade, Canberra and Commonwealth Park such wonderful places to visit. Hope you like it too. P.S. I promise, it’s not a pic of Switzerland or a postcard I found somewhere. It really is Canberra. Oh Peggy! This morning I went out and took some pictures at the small lake of a park here in Switzerland! Amazing! As I saw yours I saw similar colors and places. Only that here we have autumn, we still have flowers and the most of leaves are green. This will change next month. You have spring there and you are at home! Thanks for your post and big hug to you and your family! Aw thanks. Come visit, hint hint! A lovely photo indeed. I love mirror photos. Thanks very much for sharing. My pleasure. Glad you like the pic.